How much soap should I use with softened water? Using too much soap is a hard habit to break. When first using softened water for household cleaning, a good way to adjust to the difference in cleaning efficiency is to use as little soap as possible. Try using a quarter cup rather than the cup or more that may have been necessary prior to the installation of a water softener. If necessary, gradually increase the quantity used to produce the desired results. The most common water softening method is called “ion exchange.” Put simply, this type of softening is a process where calcium and magnesium (the minerals that make water hard) ions are exchanged for sodium ions. This exchange takes place in a “resin bed” made up of a tiny bead-like material. The beads have a negative charge and attract and hold positively charged ions such as sodium. The beads will exchange the sodium ion for a calcium or magnesium ion since they both have a more powerful positive change. The differences that separate one softener from another are features such as flow rates, salt capacity and regeneration type. Regeneration is the process of “recharging” the resin beads when they are “full” of nothing but calcium and magnesium. The type of system a softener uses to regenerate is a very important part of the process and can mean the difference between having enough soft water available or not. Regeneration “triggered” by a specific time of day is called time clock regeneration. However, one of the most effective regeneration techniques uses Aqua-Sensor® technology, which is based on actual demand. This exclusive option can result in a savings of nearly two tons of salt and 20,000 gallons of water over the lifecycle of your water softener –saving you more than any other brand. Click here for more information about Aqua-Sensor® technology. With water softeners, regeneration is the process of “recharging” the resin beads when they are “full” of nothing but calcium and magnesium. The type of system a softener uses to regenerate is a very important part of the process and can mean the difference between having enough soft water available or not. Regeneration “triggered” by a specific time of day is called time clock regeneration. Systems set to run after a specific number of gallons have been used are referred to as metered. However, one of the most effective regeneration techniques uses Aqua-Sensor® technology, which is based on actual demand. This exclusive option can result in a savings of nearly two tons of salt and 20,000 gallons of water over the lifecycle of your water softener – saving you more than any other brand. What is the Aqua-Sensor® technology, and how can it help me save on salt and water? of nearly two tons of salt and 20,000 gallons of water over the lifecycle of your water softener –saving you more than any other brand. With Aqua-Sensor® technology, consumers can make sure that the year-in and year-out operating costs of a water softener are as low as possible. Aqua-Sensor® technology is available as an option on two of Culligan’s full-featured water softener lines, the Culligan Gold SeriesTM and the Culligan Platinum Series®. According to the U.S. Geological Survey, more than 85 percent of the United States geography has hard water. While many consumers use a water softener so they can enjoy the benefits of soft water, there is some confusion about whether softened water is safe to drink. Some consumers are concerned that drinking softened water will increase the level of sodium in their diet. Despite the myth, softening your water will not result in salty-tasting water. Sodium bicarbonate, which is different from sodium chloride (table salt), is formed through the water softening process. The amount of sodium added to water from the water softening process depends on the hardness of the water supply. When very hard water (greater than 10 grains of hardness per gallon) is softened, only 20 to 40 mg of sodium is added to every 8 ounces of water. For comparison, an 8-ounce glass of low-fat milk contains about 120 mg of sodium, a 12-ounce can of diet soda contains from 20 to 70 mg, and an 8-ounce glass of orange juice contains about 25 mg. The majority of the sodium in consumers’ diets — more than 90 percent — comes from sources such as processed foods and table salt. The recommended daily allowance for sodium consumption is 2,400 mg. drinking two quarts of softened water would only add approximately 240 mg of sodium to your diet. Individuals concerned about sodium in their diet should consult their physician about effective means of reducing overall sodium consumption. Hard water forms when naturally occurring minerals enter water sources. Over time these minerals are absorbed by groundwater. The two most common types of minerals found in hard water are calcium and magnesium compounds. These minerals’ presence can make cleaning more difficult and can reduce the lifespan of household appliances. Luckily, there’s a simple, safe solution to hard water. Installing a water softener is quick, easy and greatly reduces the natural hard minerals found in water, making it easier to get clothes clean, leaving skin less dry and irritated, and making showering more pleasant. During the water softening process, water softening salt charges thousands of tiny resin beads inside the water softener with sodium ions. As hard water moves over the resin beads, the calcium and magnesium minerals are attracted to the beads and replaced with sodium ions, creating soft water. Over time, the resin beads will become full of minerals and need to be recharged. This process is known as the water softener’s regeneration cycle. The frequency of regeneration varies depending on the water usage of each home and the source water’s hardness. The term “hard water” was originally coined to refer to water that was difficult or hard to work with. Hard water requires much more soap, shampoo or detergent than soft water, so your soap products don’t stretch nearly as far. The effects of hard water are felt most often in daily household activities such as cleaning. The minerals present in hard water inhibit soap’s lathering and cleaning capabilities. According to New Mexico State University’s Water Heater-Energy Savings Study, the lifespan of appliances such as water heaters, washing machines and dishwashers can be reduced by as much as 30 percent when hard water is used in the home. Also, when hard water is heated, the minerals in the water can precipitate out and form scales in the bottom of the water heater. These scales may build up and result in increased water heating costs. Another factor to consider is the high costs associated with repairing major appliances. How much would you be willing to pay to repair a 5-year-old washing machine? Due to the high cost of repairs, replacement is often the best option once hard water has wreaked havoc on an appliance. By using soft water you can add more than three years to the longevity of most of your appliances — and save yourself the expense of replacing them much sooner than you expected. Need to shorten your “to-do” list? If you have a water softener in the house, one item you can cross off your list is buying salt and filling the salt tank, thanks to the new two-part Salt ’n Service delivery program from Culligan®. First, your local Culligan Man® will deliver salt right to your home and into your water softener. He’ll work with you to assess your salt usage so we can deliver the salt you need, when you need it, automatically! Then, with every salt delivery, our trained water expert will conduct a 10-point inspection of your water softener – from checking the time setting, salt level, and water level in the salt tank to looking for leaks. And, all remaining salt bags will be stacked neatly, and empty bags discarded into your trash. Don’t cart home another load of salt! 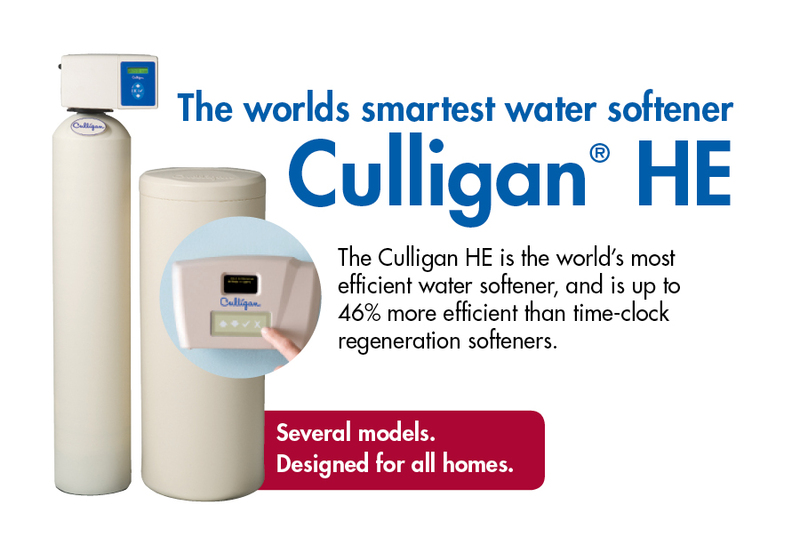 Contact your local Culligan® Dealer today for more information on this terrific time-saver. According to the Water Quality Association (WQA), water softener regeneration discharges do not pose a problem to septic systems or to the leach field. Studies have shown that water softener regeneration wastes not only do not interfere with the septic tank system drain field soil percolation, but, actually could improve soil percolation, particularly in fine-textured soils. Should I use soft water in my humidifier? Soft water provides for easier maintenance of a humidifier. When hard water evaporates, a hard scale forms that normally requires some drastic removal techniques. When soft water is used, the residue is commonly called “soft” and can usually be removed by flushing the unit with water or going over the surface with a brush. Remember, softening water does not reduce the total amount of minerals present; ion exchange softening exchanges the calcium and magnesium hardness causing minerals with sodium minerals. The most common humidifier in homes has an open pan, a small tube connected to a water source, and float valve. When water evaporates, the float valve opens to permit make-up water to flow into the pan. Eventually this type of unit fills with minerals deposited by the water. Using soft water will keep the mineral build-up down and the humidifier functioning properly. First, DO NOT DRY THE GARMENTS. Second, DO NOT BLEACH. Either of these will make the problem worse! Launder with a commercial rust remover (such as RoVer®, Rit Rust Remover®, Iron-Out®, Miracle-Rid-Iron®, or Whink®). The important ingredient in these compounds is an acid-usually oxalic or hydrofluoric acid. The remover ingredients combine with the iron and loosen it from the fabric, then hold it in suspension in the wash water. The compounds are poisonous if ingested. Use them carefully according to the manufacturers’ directions, and rinse the clothes thoroughly. Acid remaining deteriorates fabrics. Commercial rust removers are intended for use only on white or colorfast fabrics. Test colored clothes for colorfastness before attempting to remove rust stains with commercial removers. Caution/Danger: Commercial Rust Remover Products contain oxalic or hydrofluoric acids or other chemicals which can cause skin or eye irritation, burns, or poisoning. Use with care and according to the product package. Follow any instructions for colorfastness testing provided on rust remover product package. If no instructions are given, follow the procedure outlined here. Rinse clothes well after treatment with iron stain removers! Note: Another iron stain situation unrelated to water quality occurs due to deterioration of the washer inner basket. Small areas near basket holes may show chipping of enamel, allowing the basket to rust. During the spin cycle, clothing comes in direct contact with this surface, and rust is deposited or transferred onto clothes. Stains may not be noticeable until dried, or may even “mysteriously” appear later in storage due to oxidation of the iron (rust). Stains may appear as small pin-points scattered over a portion of the garment, or as larger, stained areas about the size of a dime. In this case, the source of the rust must be corrected through repair or replacement of the washer basket. Stain removal procedures for stained clothing are similar to those suggested for other iron stains. Soak fabric spotted with brown rust stains in a solution of 1 part lemon juice and 1 part water for at least 30 minutes. Re-wash and check for removal BEFORE drying. Many customers who have water softeners installed in their houses notice that their skin feels “slippery” after a bath. Some customers say, “My water is too soft! I can’t rinse the soap off!” This reaction is normal for new soft water customers. What causes that slippery feeling? Clean skin! Hard water leaves an insoluble soap-curd film on you, causing your hair and skin to “squeak”. Most of us grew up with hard water, so “squeaky clean” was all we knew and what we grew to expect from our bathing and shampooing. Some of the soap manufacturers even perpetuated this misinformation with their commercials about “squeaky clean”. No wonder we all believed that we were our cleanest when our skin and hair squeaked. But, we know now that “squeaky clean” is not clean at all. It should be called “squeaky dirty”. The fact is that we “squeaked” with hard water because there was an invisible hard water soap scum film on our hair and skin, causing our skin, scalp and hair to really be overly dry. This is bad for skin and hair. Soap scum film builds up on hair, weighting it down and making it brittle and lifeless. Soap scum film on skin makes our skin dry and itchy. Here is one way you can prove this to yourself. Notice that hard water leaves a bathtub ring and soft water does not. That hard water bath tub ring is made of scummy, “gooky stuff” that sticks to the tub. That same scum sticks to your skin, clogging your pores and causing your skin to feel overly dry and “squeaky”. On the other hand, soft water leaves no bath tub ring. Soft water also does not leave scum on your skin, scalp and hair. Soft water leaves your skin and hair “hydrated and clean”, not squeaky. Since water is wet and there is not scummy film on your skin to cause friction, the water feels “slippery”. That slippery feeling is the indication of healthy, clean skin and hair. With soft water, you can rinse an extra 15 minutes but the slippery feeling will not go away! The soap is long gone and your skin is very clean. Within minutes of drying off, you will notice how soft your skin feels—almost as if you applied skin lotion. Soft skin is healthy and clean skin! Ladies, your hair will be easier to style, keep its curl longer, be more bouncy and feel weightless. Once you have experienced the wonderful clean feeling of soft water, you’ll never want to be without it again. And, your skin, hair, appliances and plumbing will thank you. If after a trial period (generally 2-3 weeks) you are still noticing the slippery feeling, we can adjust the system to eliminate the silky feeling. The complex issue of corrosion of copper water pipes is a frequent complaint. Primary concerns include deterioration of metallic plumbing, potentially harmful levels of copper in drinking water and aesthetic problems such as blue green stains or bitter taste. Addressing the concerns is often difficult due to the variety of corrosion mechanisms and the limited data on evaluating remediation techniques. The following list provides a simple approach to some of the reasons corrosion occurs. 1). How old is the copper plumbing? Sometimes, new copper pipes leach copper into water, resulting in blue-green stains until an oxidized coating builds up inside of the pipe. The problem usually takes care of itself in 6 months or less. If unsafe copper levels are a concern, consider alternative water source such as bottled water or reverse osmosis to reduce high copper levels in drinking water supply during this time. Flushing stagnant water from pipes prior to drinking may result in lower copper levels also. 2). Is there a circulating hot water pump? Continuously flowing hot water leaches copper into water just by virtue of higher temperatures accelerating natural corrosion reactions. Is it on a timer? A timer can reduce and limit hot water circulation by circulating on at times of high use. This may minimize the blue green staining associated with copper pipes. Is pipe size consistent throughout circulating loop, occasionally smaller return lines are used and a pressure differential allows dissolved gas to come out of solution and contribute to staining? 3). Water supplies with a pH of 6-7 and lower are considered acidic and known to be corrosive to metals used in plumbing systems. Culligan can provide treatment options to adjust the pH to a protective level, including neutralizing filters and injection systems. All options are available for rent or purchase. The health limit for copper in drinking water is 1.30mg/L. “First draw” water samples can be analyzed to determine the extent of the problem and identify water quality issues that may contribute to corrosion. 4). Has there ever been pinhole leaks in plumbing? Look at the holes, are they near joints? Work quality such as unreamed pipe ends or burs that result in turbulent flow can contribute to corrosion. Flux-induced pitting can be expected to occur at or near soldered connections, but have been known to occur as much as eight feet from fittings. 5). What are the size of pipe and peak flow rates of the application? If the flow is greater than recommended for the size of pipe, erosion corrosion can occur. Most experts agree to keep flow velocities less than 5 ft./sec in hot water lines and less than 8 ft/sec in cold water lines. Excessive flow rates can be diagnosed by the bright shiny internal surface of the pipe with characteristic U-shaped pits, similar to horseshoes. 6). Microbial-induced corrosion is the result of bacteria slime forming inside pipes, creating an environment capable of corroding copper. Shock chlorination of the water supply and distribution plumbing can help control this form of corrosion. 7). Is there potential for water to sit stagnant in pipes for long periods of time? Water being the “universal solvent” can leach copper with long contact time alone. Modify the plumbing design to eliminate the “seldom used” branches. 8). Is there blue-green staining? Is it limited to one location or throughout the house? Cleaning or soap products containing blue green dyes can be the source of staining, switching to products without dyes may resolve the problem. Clean stains prior to changing products to evaluate. 9). Look for any dissimilar metals in contact in the plumbing system, especially where plumbing comes into building or connections at he hot water heater. “Galvanic corrosion” occurs with dissimilar metals when an electric current allows the less noble metal to dissolve into water. Small-localized areas where the copper alloy isn’t continuous can allow this reaction to occur. Electrochemical reactions may occur even if ductwork or gas lines are near or touching copper plumbing. Wrapping pipes with electrical tape will prevent static electricity effects. Dielectric unions can separate metals so this galvanic reaction is eliminated but disruptions of copper plumbing such as hot water heaters of plastic sediment filters may benefit from ground wires between connections to maintain metallic continuity. If cathodic protection is required, contact a qualified electrician. 10). Have neighbors complained of similar problems? There may be a localized grounding issue that is affecting more than just one household. Contact the municipal water supply to inquire about this concern. 11). Make sure any ground clamps on the water main are tight. Grounding cable TV or phone lines to the main can be problematic if the clamps are loose or if the copper is connected to plastic lateral pipe from well. An electrical inspector can evaluate grounding to verify if the grounds are tied together at the electrical box and connected to a remote ground. Please contact Culligan Water if you have any question. Bring your own bottle. $1 to fill up five gallons. Great tasting water. Can't beat it! To Culligan Water Conditioning of Missoula and Axil Plumbing, Heating & Air of Missoula My wife and I wish to formally express how pleased we are with the great service provided, and proving how well two service companies can "play well together" at the same time. The coordination displayed in completing the work in minimal time was not only impressive, but much appreciated. I cannot say enough about how both services showed up as scheduled, the wonderful attitude and professionalism shown by your people in completing the work. We are very happy in choosing you both, and will gladly step forward with a strong recommendation. The best water company in montana! 59820 – Alberton, MT; 59821 – Arlee, MT; 59823 – Bonner, MT; 83462 – Carmen, ID; 83226 – Challis, ID; 59824 – Charlo, MT; 59825 – Clinton, MT; 59826 – Condon, MT; 59827 – Conner, MT; 59828 – Corvallis, MT; 59829 – Darby, MT; 59830 – De Borgia, MT; 59831- Dixon, MT; 59832 – Drummond, 83617 – Emmett, ID; 59833 – Florence, MT; 59834 – Frenchtown, MT; 83463 – Gibbonsville, ID; 59837 – Hall, MT; 59840 – Hamilton, MT; 59842 – Haugan, MT; 59843 – Helmville, MT; 59844 – Heron, MT; 59845 – Hot Springs, MT; 59846 – Huson, MT; 83404 – Idaho Falls, ID; 83464 – Leadore, ID; 83465 – Lemhi, ID; 59847 – Lolo, MT; 59848 – Lonepine, MT; 83252 – Malad City, ID; 59851 – Milltown, MT; 59801 – 59802 – 59803 – 59804 – 59806 – 59807 – 59808 – 59812 – Missoula, MT; 83466 – North Fork, ID; 59853 – Noxon, MT; 59854 – Ovando, MT; 59855- Pablo, MT; 59856 – Paradise, MT; 59841 – Pinesdale, MT; 59859 – Plains, MT; 59860 – Polson, MT; 59864 – Ronan, MT; 83467 – Salmon, ID; 59867 – Saltese, MT; 59868 – Seeley Lake, MT; 59865 – St. Ignatius, MT; 59866 – St. Regis, MT; 59870 – Stevensville, MT; 59871 – Sula, MT; 59872 – Superior, MT; 83468 – Tendoy, ID; 59873 – Thompson Falls, MT; 59874 – Trout Creek, MT ; 59875 – Victor, MT and surrounding areas.